But, as with many things in life, over time it got boring. Cars were going fast, but spectacular manoeuvres disappeared gradually from the races. At the moment, we’re rather surprised when a Formula One car race is taking place. 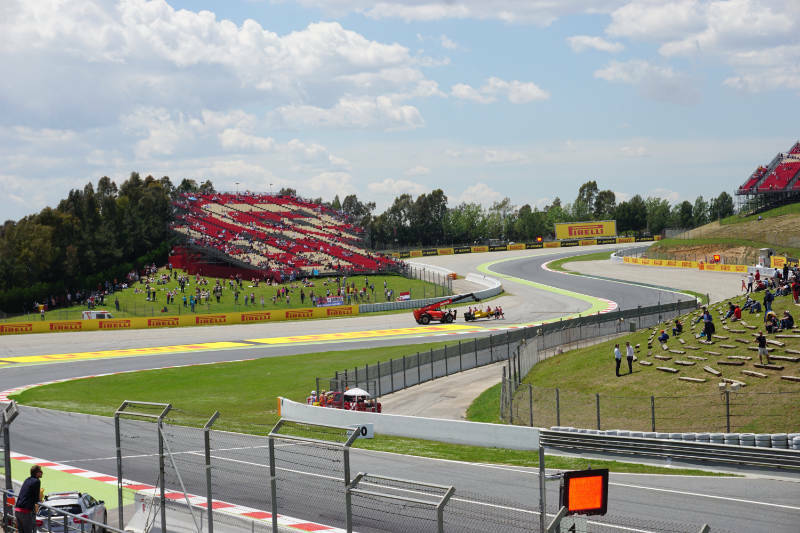 When I was in the middle of planning our Barcelona trip I noticed that we would be there during the race weekend between the 13th and 15th of May 2016. I admittedly only noticed when I looked up the opening hours of the race track. After thinking long and hard about it, we decided to pick up some tickets - despite the fairly high price point – for the free practice on Friday. We purchased the tickets for visiting the Formula One car race online in advance. The choice of seating is rather limited for visitors that only come for one day. Most of the stands are only open for weekend visitors and we didn’t want a space on the open-air stands. 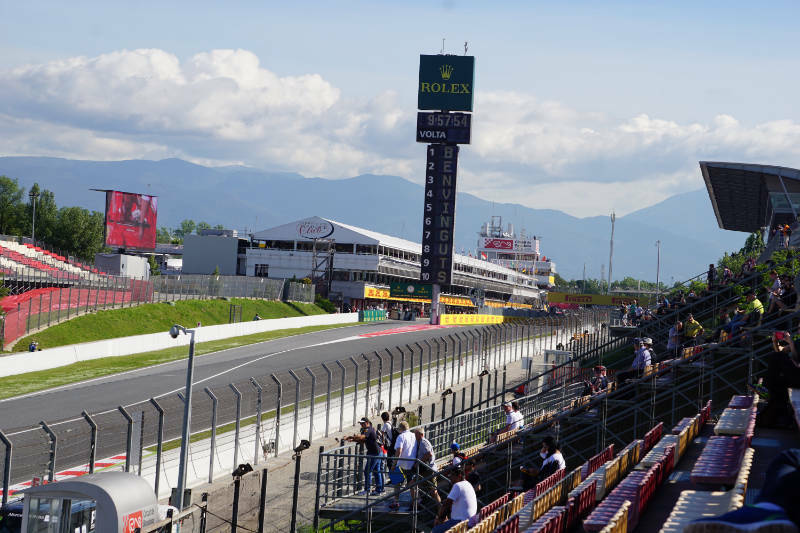 Luckily the booking system with its panorama pictures gave us a good idea of the bit of the race track that we would actually be able to see from any given seat. 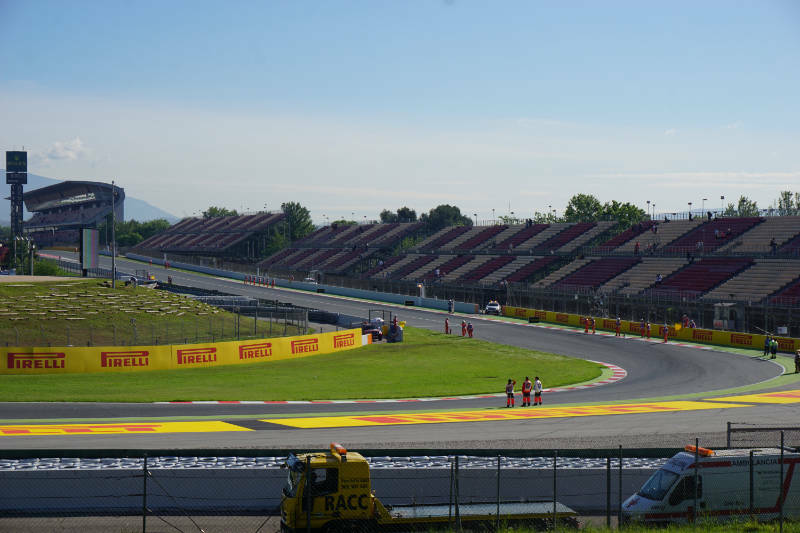 We chose area E. The stands of area E are close to the end of the home straight – we had good visibility of the first turn, the pit lane as well as of other parts of the race track. Two big screens were right opposite of the stands and showed further information about the practice. Once on site, we realised that this was a smart choice. Getting to the race track from Barcelona is easy on public transport. For 2.50€ (single ticket, per person) the R2 train took us from Sants Estacio station to Montmeló. The gates opened at 9 o'clock in the morning, the first free practice was due to start at ten. So we set off bright and early and shared the train with some English motorsport enthusiasts. The train ride took about 25 minutes. There are different options to get to the racetrack from Montmeló. 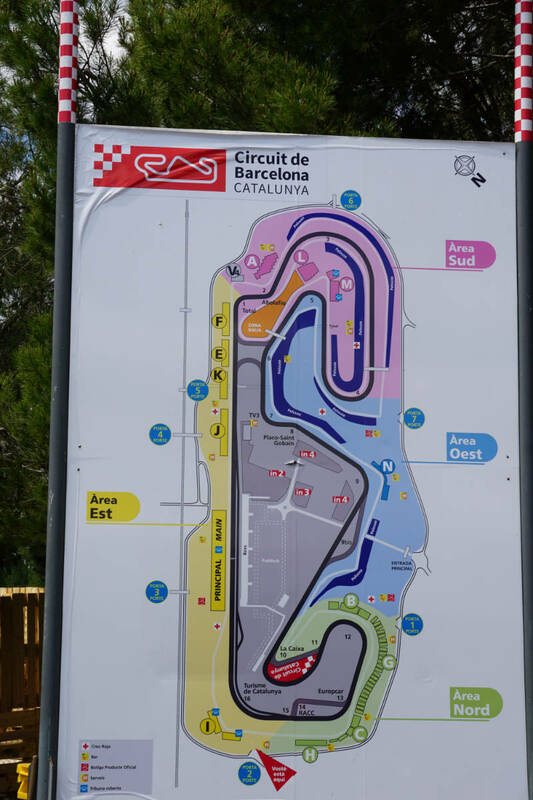 One option is to take the bus (for another 2.50€ single per person) or a 30-minute walk following the signs for the race track through a pedestrianised area of the city. We arrived a little early and used the extra time to walk along the race track before the free practice began. We noticed that access to the stands wasn’t really checked on that day and most of them appeared to be open to everyone. Where we were seated was check, however, as only day pass holders booked their seats in these stands. Next, the elements of the free practice were introduced. We did not know that after the 1.5 hours of Formula One free practice, Formula Three practice and qualifications were going to be held there as well. For almost 8 hours straight cars were going to be flying around these curves at high speed. The practice began and we were really lucky. The drivers were keen that day and completed many laps on the track. That meant that we got to enjoy how the drivers scorched down the home straight at 310 km/h and only about 100 meters before the first turn slowed down to 135 km/h. Many drivers took this turn in very noisy second gear at 135 km/h. A left-right bend followed that was still within eyeshot from our seats. Naturally, only very few overtaking manoeuvres occur during free practice. But seeing the cars leaving the pit lane was also fascinating. Many times the drives had to come to almost a complete stop because a blue flag signalled that they had to let another driver on the track pass. The second free practice needed to be stopped due to a burst tyre until a crane – also very clearly visible from where we sat – had lifted the car off the track. Thankfully, that was the worst accident on that day. After the first practice session, we walked around the whole race track to get a better understanding of the circuit. In some areas around the track, different activities and entertainment for the visitors were taking place. Merchandise, a drummer band and much more mixed things up for the guests. We enjoyed the day in Montmeló. The weather was good, the drivers showed off their skills and my first time at a Formula One free practice was good fun. If I will be doing it again in the future remains a question for another time. The view of the track is, after all, better from in front of the telly and you’re fed more info about what is going on in the race. Visiting the track means hearing the sound of the engines and smelling the burning rubber. Let’s wait and see if there is going to be a second time.